I am sure you all know how much I love shopping at Target. I usually make a trip once a week and I can never just buy what I went to get. I always wonder off into the clothes or accessory section and end up spending way more money then I planned on spending. 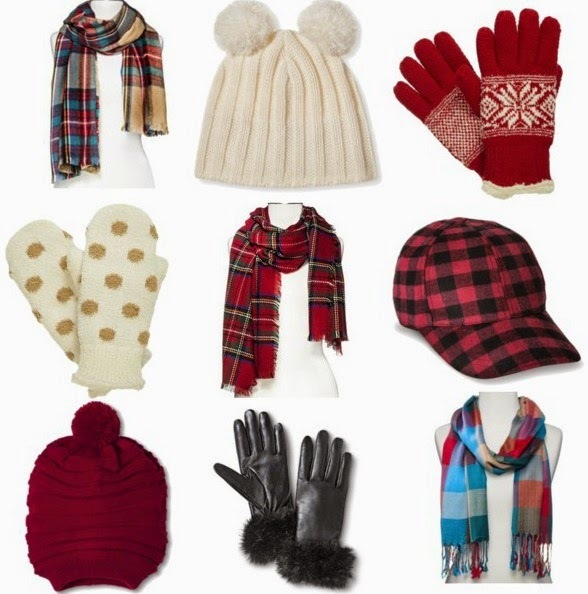 Today I wanted to share some of my favorite cold weather accessories because Target has so many great things and they really are so affordable. Of course I had to include the infamous oversized plaid scarf. I just can't believe Target has it and how inexpensive it is. Also I am really into wearing beanies the last few weeks and Target has so many to cute ones to choose from that are so affordable. I am doing the majority of my Christmas shopping at Target. They pretty much have something for everyone! And they offer free shipping! I hope you all have a great weekend! Hopefully I will be able to get some outfit pictures done. I am so behind with my blog because it is getting harder and harder to find the energy to take outfit pictures! I just adore Target! I feel like they have the cutest scarves this year!! That double pom beanie is so cute! Those mittens are so cute! Very Kate Spade inspired. target feels a little bit like home and I'm in the same boat--where I can't ever just buy what I went in for. so many great selections here. Ahh I have been loving target for the winter clothes lately! So cute. Love that scarf! Such great picks! I love the plaid! Hope you have a wonderful weekend, Jade! Love the polka dot mittens. How cool and inspiring! I love your post!